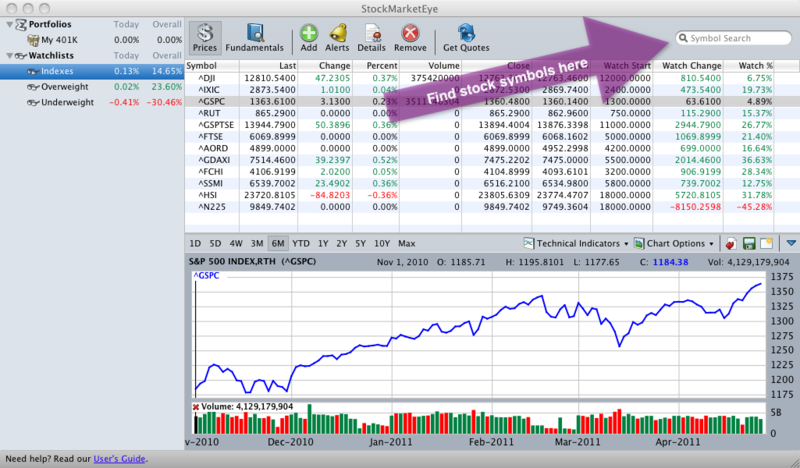 StockMarketEye provides built-in symbol search technology that can help you get started quickly. 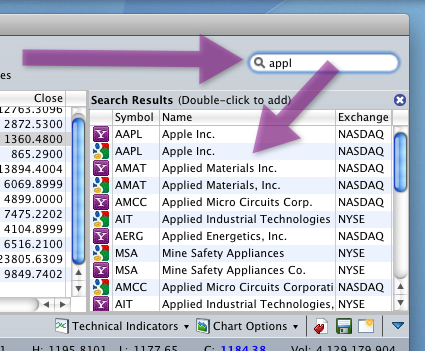 You’ll find the “Symbol Search” field in the upper right side of the StockMarketEye window. Just start typing the name of a company or ticker symbol in this field and StockMarketEye will display a list of the 10 most likely, existing ticker symbols. The search results are displayed just below the symbol search field. The search results display the symbol, full name of the security and the exchange on which it trades. There is also an icon that represents the data provider for this symbol, either Yahoo! Finance ( ) or Google Finance ( ). If a symbol is listed twice, once for Yahoo and once for Google, you have the choice of which data provider you’d like to use for this symbol. If the search results show the ticker symbol you’re looking for, simply double-click it to add it to your Watchlist or Portfolio. Sometimes “Symbol Search” does not offer any ticker symbols that match what you are really looking for. There are 2 typical reasons for this. The first is that this can happen when the symbol or company you are looking for no longer exists. StockMarketEye’s symbol search only returns currently active ticker symbols. If shares of the company you are looking for no longer trade on any exchange (due to a buy-out, de-listing or any other reason), StockMarketEye will not be able to find a corresponding symbol. The second reason is that StockMarketEye’s symbol search gives priority to US-exchange listed symbols. If you are looking for ticker symbols of stocks that trade on non-US exchanges, they are also available in StockMarketEye. You can read more about them in the section on Data Providers and in the individual country information pages. Not finding the ticker symbol you are looking for is not necessarily a problem. StockMarketEye can only retrieve current price data for existing ticker symbols. However, if you don’t want or need current price data (say, because you are entering old, closed-out positions; or because you are adding a non-quoted item to your portfolio such as a CD or bond), you do not need an existing ticker symbol. In this case, you can ignore StockMarketEye’s warning about an invalid symbol.